The Nippon Volunteer Network Active in Disaster (NVNAD) sent volunteers by a special volunteer-transport bus from Nishinomiya in Hyogo Prefecture to Noda Village in Iwate Prefecture for a 4-day visit from December 9th (Fri) to 12th (Mon), 2011. 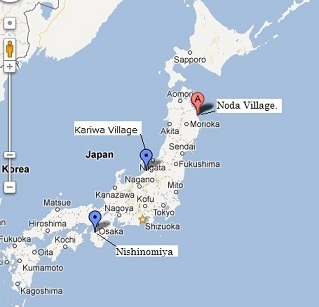 Noda Village is one of the areas seriously damaged by the 2011 Great East Japan Earthquake and Tsunami. This is the twelfth time that NVNAD sends its volunteers to the field. On December 9th (Fri), the bus left Nishinomiya City Hall at 2 p.m. Another group of volunteers also came by bus from Kariwa Village in Niigata Prefecture, which was an area affected by the 2007 Chuetsu-oki Earthquake. The two groups met at Kurosaki Parking Area on Hokuriku Expressway in Niigata Prefecture at 10 p.m. Then, they headed together for Noda Village. On the following day, they arrived at Noda Village Hall at 8 a.m. on schedule. The temperature was only – 7 ℃, which was very hard for many of us who are not used to such cold temperatures. In front of the Village Hall, all volunteers from Kariwa and Nishinomiya met Mr. Seki, who is a faculty member of Kwansei Gakuin University, and the NVNAD Director, Mr. Atsumi, both of whom had arrived earlier. A briefing of the day’s events was held after greetings were exchanged. On the first day, December 10th, we had plans for a mochi-tsuki (i.e. pounding of steamed rice to make mochi rice cakes) at the temporary housing in Izumizawa, as well as a tea party and a bingo game in the community room. At 9 o’clock in the morning, all volunteers went to the temporary housing to set up the mochi-tsuki tools and equipments brought by the volunteers from Kariwa and to steam glutinous rice. The mochi-tsuki event started from 10:30 a.m. along with the temporary housing residents. For this event, glutinous rice for about 100 participants was brought by the volunteers from Kariwa Village. Putting steamed rice in a mortar, the temporary housing residents and volunteer students pounded the rice with a mallet by taking turns. Children at the temporary housing also joined. They all looked so happy with smiles when they were pounding rice. At the same time, in the common room of Noda Junior High School Temporary Housing, a brooch-making workshop was held by some of the Kariwa volunteers who are good at handicrafts. They showed how to make the brooches to a group of temporary housing residents who regularly make handicrafts together. They made their own beautiful brooches in a friendly and warm atmosphere. The mochi-tsuki event at the temporary housing ended successfully. This was reported in Iwate Nippo, a local newspaper on December 11th. In the afternoon, the volunteers from Kariwa Village visited each household in the temporary housing to deliver assorted cookies donated by Bourbon Corporation, a confectionary company based in Niigata Prefecture. Also in the afternoon, the Nishinomiya group organized a tea party and a bingo game at the community room in Izumizawa Temporary Housing. Some residents of the temporary housing and the volunteers from Kariwa and Nishinomiya all socialized having donuts and coffee jellies. The donuts were donated from Nishikita Kashi Kobo, a confectionary in Nishinomiya, and the coffee jellies were handmade by Mr. Takemoto, Chairman of Kariwa Village Council of Social Welfare. During the bingo game, when the numbers were called out, we could hear participants excitedly shout, “I’ve got it! I’ve got it!” The winners got to choose one out of many gifts prepared for this event. By the end, all the participants received some gifts. We were very glad to see that they had a good time with the bingo game. When the bingo game finished at 15:30, we cleaned up together. The Nishinomiya group got on a bus from the parking area in Noda Junior High School, and left for Eboshi-so lodge at 16:30. The volunteers from Kariwa remained to take part in a social event hosted by Team North Rias. Then, they went to their accommodation at the Kuji Daiichi Hotel. As soon as the Nishinomiya group arrived at their lodge, they all had a hot bath to warm their cold bodies. After dinner, they had a debriefing in the lobby. As some students had never participated in the support activities in Noda Village, many of them commented that they did not know what to say to the residents in temporary housing. However, they also expressed proactive and positive attitudes, which were encouraging. In addition, a reporter from the Asahi Shimbun, a leading Japanese newspaper company, had come along with the volunteers from Nishinomiya and he gave us some valuable comments about volunteer activities from a reporter’s point of view. This debriefing brought the first day’s activities to a closure at 9 p.m.